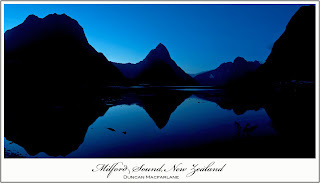 We drove from Te Anau to Milford sound yesterday morning. We woke up and it was so foggy, cloudy, rainy, you name it. On the drive there it pretty much cleared up to be a beautiful sunny day. Excellent. The drive there was spectacular. It pretty quickly turned from farm land and shrubs (which has covered every other square inch of land in NZ we have seen so far) into massive mountains. The shrubs are replaced by massive old mossy trees. It kind of reminds me of harry Potter or Jurassic park. But the drive was about 2 hours from Te Anau. When we got there I ran around taking photos but the light was pretty horrid shining right in my eyes. And is was really really windy. We booked a cruise called the 'encounter cruise' and went on that. 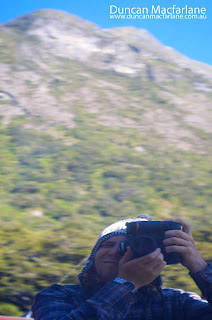 It was a 2hr 15m cruise all the way to the end of the fiord and back. Like I said it was so windy, you wouldn't go surfing if it was this windy at home. 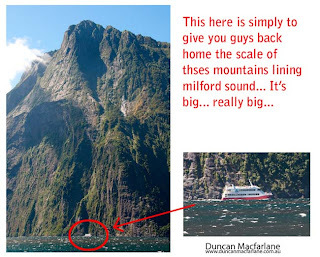 however at the mouth of the Fiord at the ocean it was dead calm, not a ripple of wind, the Milford Sounds cliffs must just funnel the winds and concentrate it in one spot. On the way back they pulled the ferry right under this waterfall about 5-10m from the cliff. We all got sprayed with a bit of water. Anyway, we stayed at a place just down the road over looking mountains and a river with ridiculously clear water. Caitlan stayed in the van and read a book while I walked back down to the Milford sound to catch the sunset which was a 15 minute walk. I then did the 15 minute walk back through though the old mossy forest in the dark which was pretty creepy but there were glow worms everywhere and it kind of looked like avatar's forest. On the way back we stopped at a place called the 'Chasm' so we had to check it out. 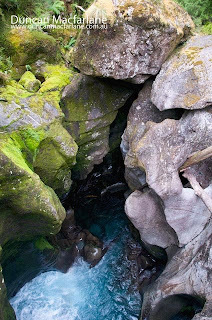 It was a place where a creek had over millions of years churned away all the soft rock leaving the hard rock in these crazy formations and caves and waterfalls. It was a 5 minute walk but was awesome. 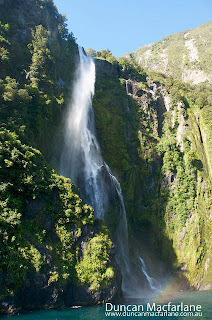 The photos dont do it justice but in that black hole down the bottom of the photo is a 30m waterfall. We have since headed back to Lake Te Anau and it has been our first full day of cloud, So I have been editing photos and hanging around. 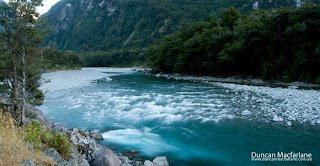 Next up is Queenstown and some white water rafting tomorrow which Caitlan and myslef are looking forward to.